TORONTO, ONTARIO--(Marketwired - June 22, 2017) - First Cobalt Corp. (TSX VENTURE:FCC)(OTCQB:FTSSF) (the "Company") is pleased to announce it has entered into a non-binding letter of intent ("LOI") to acquire all of the issued and outstanding shares of CobalTech Mining Inc. (TSX VENTURE:CSK), an arm's length party, through a negotiated share exchange transaction. 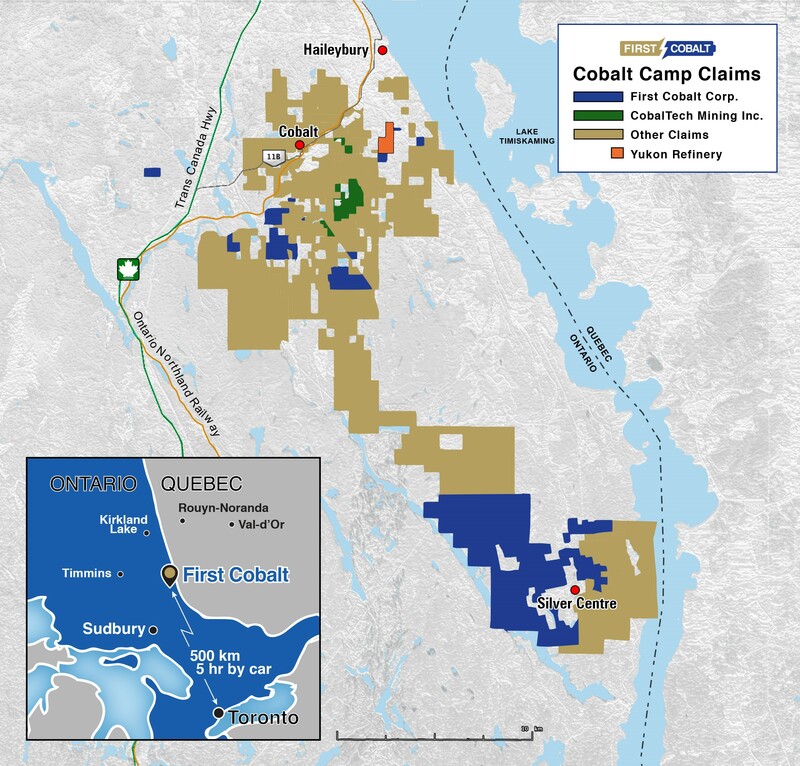 CobalTech has assembled a strong portfolio of prospective cobalt properties, including 11 past producing mines in the town of Cobalt, Ontario, the Werner Lake East Cobalt property near Kenora, Ontario and eight properties in the Province of Quebec. Its flagship asset is the Duncan Kerr Project and includes the past-producing Kerr Lake and Lawson mines which operated between 1905 and 1966 and reportedly produced approximately 32.7 million ounces of silver as well as significant cobalt by-product. CobalTech also owns a 100 tonne per day mill in the town of Cobalt. This asset would complement the Yukon refinery, over which First Cobalt has a joint venture option for a 50% interest. CobalTech has 6,588 tonnes of crushed stockpile with an average grade of 761 g/t Ag and 0.95% Co over 2,000 samples on its Duncan Kerr property.1 The potential quantity and grade of this stockpile is conceptual in nature, there has been insufficient exploration to define a mineral resource and it is uncertain if further exploration will result in the stockpile being delineated as a mineral resource. The LOI provides both parties the opportunity to exchange information and maintain confidentiality as each party seeks to determine whether mutually beneficial business opportunities may exist. The LOI does not represent a change of business for either company. The LOI does not contemplate a definitive agreement between the parties. First Cobalt has engaged Canaccord Genuity Corp. as financial advisors and Cassels Brock and Blackwell, LLP as legal advisors on any transactions entered into by the Company. "We believe CobalTech's assets in the Cobalt camp are complementary to our own, and see this transaction as an opportunity to provide value to both our shareholders and those of CobalTech. The future potential from 11 additional past producing mines, as well as a milling facility could provide the pathway to early production in this region. This potential transaction is a credit to the quality assets the team at CobalTech have built." "First Cobalt has a strong vision for the future of this region and this transaction will be beneficial to both to CobalTech shareholders and the community. We look forward to finalizing this transaction with First Cobalt in due course." Readers are cautioned that the LOI entered into with CobalTech is non-binding, and that completion of the transaction is subject to a number of conditions, including but not limited to, completion of due diligence, negotiation of definitive agreements in respect of the transaction, receipt of any required regulatory approvals, the approval of the TSX Venture Exchange, and the approval of the shareholders of CobalTech. The transaction cannot be completed until these conditions are satisfied. There can be no assurance that the transaction will be completed as proposed or at all. First Cobalt is focused on building a diversified global portfolio of assets that are highly leveraged to the cobalt market. The Company's current assets include almost 3,000 hectares and three former mines in the Cobalt camp in Ontario, Canada. Cornerstone assets include an option for the former producing Keeley-Frontier mine, a high-grade mine that produced over 3.3 million pounds of cobalt and 19.1 million ounces of silver from 301,000 tonnes of ore, as well as a joint venture option on a fully permitted cobalt refinery in Cobalt, Ontario. The Company also has interests in seven prospective copper-cobalt properties covering 190 square kilometres in the Democratic Republic of the Congo, all with known surface mineralization. Antoine Fournier, P. Geo., M.Sc., Vice President, Exploration for CobalTech is the Qualified Person, as defined by National Instrument 43-101, for the technical information about CobalTech contained in this news release and he has reviewed the technical information contained herein. On behalf of CobalTech Mining Inc. This news release may contain forward-looking statements and forward-looking information (together, "forward-looking statements") within the meaning of applicable securities laws and the United States Private Securities Litigation Reform Act of 1995. All statements, other than statements of historical facts, are forward-looking statements. Generally, forward-looking statements can be identified by the use of terminology such as "plans", "expects', "estimates", "intends", "anticipates", "believes" or variations of such words, or statements that certain actions, events or results "may", "could", "would", "might", "occur" or "be achieved" and include all statements related to the possibility of a merger between Cobalt One and CobalTech. Forward-looking statements involve risks, uncertainties and other factors that could cause actual results, performance and opportunities to differ materially from those implied by such forward-looking statements. Factors that could cause actual results to differ materially from these forward-looking statements include the reliability of the historical data referenced in this press release and risks set out in First Cobalt's public documents, including in each management discussion and analysis, filed on SEDAR at www.sedar.com. Although First Cobalt believes that the information and assumptions used in preparing the forward-looking statements are reasonable, undue reliance should not be placed on these statements, which only apply as of the date of this news release, and no assurance can be given that such events will occur in the disclosed times frames or at all. Except where required by applicable law, First Cobalt disclaims any intention or obligation to update or revise any forward-looking statement, whether as a result of new information, future events or otherwise.